Norma occipitalis is convex upwards and on each side, and is flattened below. 1. Posterior parts of the parietal bones, above. 2. Upper part of the squamous part of the occipital bone below. 3. Mastoid part of the temporal bone, on each side. 1. The lambdoid suture lies between the occipital bone and the two parietal bones. Sutural bones are common along this suture. 2. The occipitomastoid suture lies between the occipital bone and the mastoid part of the temporal bone. 3. The parietomastoid suture lies between the parietal bone and the mastoid part of the temporal bone. 4. The posterior part of the sagittal suture is also seen. 1. Lambda, parietal foramina and obelion have been examined in the norma verticalis. junction of the head and the neck. The most prominent point on this protuberance is called the inion. 4. The highest nuchal lines are not always present. They are curved bony ridges situated about 1 cm above the superior nuchal lines. They begin from the upper part of the external occipital protuberance and are more arched than the superior nuchal lines. 5. The occipital point is a median point a little above the inion. It is the point farthest from the glabella. 6. 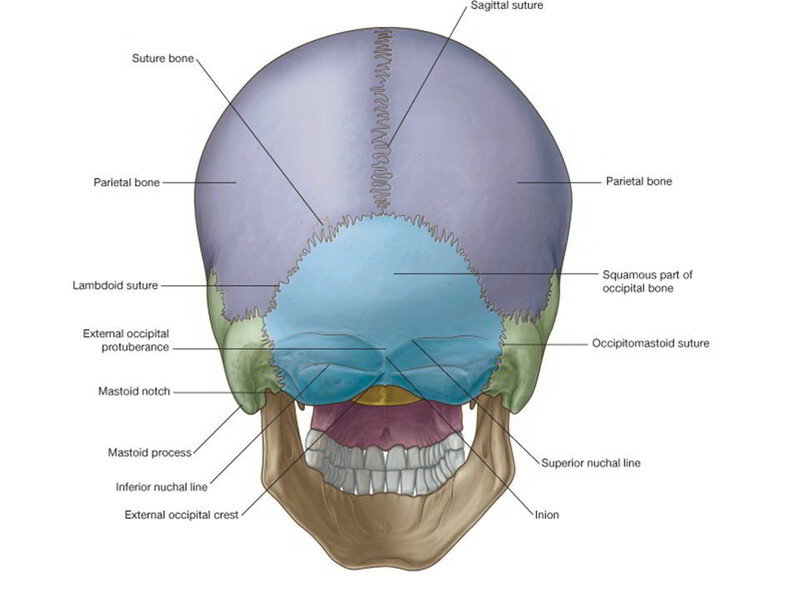 The mastoid foramen is located on the mastoid part of the temporal bone at or near the occipitomastoid suture. Internally, it opens at the sigmoid sulcus. The mastoid foramen transmits an emissary vein, and the meningeal branch of the occipital artery. 7. The interparietal bone is occasionally present. It is a large triangular bone located at the apex of the squamous occipital. This is not a sutural or accessory bone but represents the membranous part of the occipital bone which has failed to fuse with the rest of the bone. 1. The upper part of the external occipital protuberance gives origin to the trapezius, and the lower part gives attachment to the upper end of the Uggmgnium nuchne. 2. The medial one-third of the superior nuchal line gives origin to the trapezius, and the lateral part provides insertion to the sternocleidomastoid above and to the solenius capitis below. 3. The highest nuchal lines provide altachment_to the enicranial anoneurosis medially, and give origin to the nccinitalis or occipital belly of occipitofrontalis muscle laterally.